hardcover • 8.25" x 10.25" • 176 pp. On the occasion of the tricentennial of the founding of New Orleans, this exhibition catalog celebrates the diversity of the city’s earliest populations. 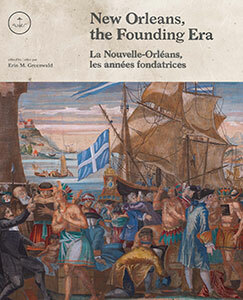 New Orleans, the Founding Era gathers contributions from eight leading scholars of the French Atlantic World and features an illustrated checklist of artifacts from public and private collections across France, Spain, Canada, and the United States. This dual-language French/English publication from The Historic New Orleans Collection explores the ideas, peoples, and material cultures that shaped one of the most complex and challenging colonization projects in the Americas. Louisiana in the early eighteenth century experienced an intense period of immigration as nearly six thousand French- and German-speaking Europeans and a roughly equal number of enslaved captives taken from Africa arrived in the French territory. Those who survived first the crossing, and then exposure to New World diseases, established the roots of a blended, Creole culture that persists to this day. The newcomers mingled with, learned from, and clashed with the native people who had long occupied the riverfront site chosen for New Orleans. As a cultural, economic, and diplomatic crossroads both of the lower Mississippi valley and of the broader Atlantic World, New Orleans was shaped by influences that stretched south from Nouvelle France and the Illinois Country, north from the Caribbean, and west from the Bight of Benin and the Breton coast. This landmark publication, edited by Erin M. Greenwald and translated by Henry Colomer, reflects the kaleidoscopic array of cultures that gave rise to this most cosmopolitan of North American cities. Erin M. Greenwald curated New Orleans, the Founding Era in honor of the city’s tricentennial. As curator at The Historic New Orleans Collection, she was project director of the National Endowment for the Humanities-funded traveling exhibition Purchased Lives: The American Slave Trade from 1808 to 1865. Greenwald holds a PhD in history from the Ohio State University. She is currently curator of programs at the New Orleans Museum of Art. Henry Colomer is a French documentary filmmaker and translator. He has directed some thirty films, including various portraits of artists and writers (L’exilé, Iddu, Ricercar, Vies métalliques), as well as a number of documentaries about the upheavals of the twentieth century (Monte Verità, Sous les drapeaux). Colomer has won several awards (Best Historic Documentary, Festival of History Films, Pessac, 1998, 2008; Focal International Award, London, 2010). This book has been made possible with support from the 2018 NOLA Foundation, Air Liquide, Alliance Française de la Nouvelle-Orléans, L’Union Française, Les Causeries du Lundi, France-Louisiane Franco Américaine Association, Consulate General of France in New Orleans, IBERIABANK, French American Chamber of Commerce—Gulf Coast Chapter, Dr. Phillip D. Mollère, E. Alexandra Stafford, and Council of French Societies of New Orleans.